Karen McAloon creates a "retro" red Christmas look featuring the Candy Apple Red Christmas tree by Treetopia ™ for HGTV's Christmas decorating special, Decked for the Holidays. 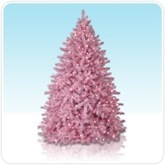 HGTV host Karen McAloon featured the Candy Apple Red Christmas tree, made by online artificial Christmas tree retailer Treetopia ™, on the Nov. 23rd airing of Decked for the Holidays, HGTV's holiday miniseries. McAloon, the self-taught design maven and host of HGTV shows Design Remix and Find Your Style, worked with a family to create a different retro, festive holiday style for their cookie decorating party. Inspired by vintage red kitchen chairs already owned by the family, McAloon decorated the kitchen in red using placemats, candy-themed wall ornaments, and the main attraction: her choice of the "retro" red Christmas tree. To accent the red tree, McAloon selected over-sized candy cane ornaments, frosted globe ornaments, shiny silver glass ornaments and glittery white snowflake garlands, all of which helped define the bright, retro feel of the interior decorations. 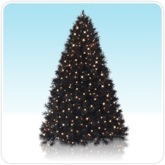 Snapshots of McAloon's "retro" red artificial Christmas tree and other tree decorating ideas are on the HGTV website. Treetopia ™ spokeswoman Carrie Chen, gracious to McAloon for featuring the Treetopia red tree, also has a bundle of suggestions for how to decorate the red Christmas tree. 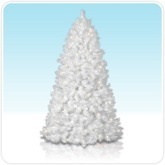 The Barber Shop Christmas Tree: wrap a white ribbon around the tree in a spiral, like the stripe on a barbershop pole. Retro red or white big-bulb Christmas lights brighten and cheap plastic combs make great ornaments. White globe ornaments complete the fun, nostalgic look. 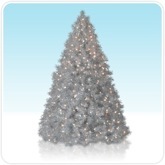 The Reverse Color Tree: change it up with a green ornaments on a red tree. Use wide green ribbons, green globe ornaments, green beaded garlands and holly. A few strands of green Christmas lights complete the look. The Patriotic Christmas Tree: Use red, white and blue ribbons, white light strands, and red, white and blue globe ornaments to show your national spirit. There are tons of options out there for Americana-themed ornaments, from flags to patriotic Santas. Carrie Chen, spokeswoman for Treetopia ™ is a huge fan of creative tree themes. "More and more, I think people are treating their trees as an opportunity to express their personality and have fun doing it. The candy cane concept McAloon created exemplifies this trend. It's perfect for a kid's cookie decorating party." Treetopia.com is an online store featuring a diverse selection of artificial Christmas trees. 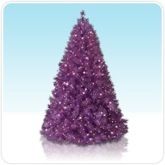 Featuring traditional artificial Christmas trees, white artificial Christmas trees, black artificial Christmas trees, pink artificial Christmas trees, silver artificial Christmas trees, lime green artificial Christmas trees, purple artificial Christmas trees, upside-down artificial Christmas trees, lighted palm trees, trimmings, tree skirts and decorations , Treetopia has something for everyone. They sell exclusively online through http://www.treetopia.com.